WASHINGTON — Scientists have found an extra charming new subatomic particle that they hope will help further explain a key force that binds matter together. Physicists at the Large Hadron Collider in Europe announced Thursday the fleeting discovery of a long theorized but never-before-seen type of baryon. The high-speed collisions at the world's biggest atom smasher created for a fraction of a second a baryon particle called Xi cc, said Oxford physicist Guy Wilkinson, who is part of the experiment. The particle has two heavy quarks -- both of a type that are called "charm" -- and a light one. In the natural world, baryons have at most one heavy quark. It may have been brief, but in particle physics it lived for "an appreciably long time," he said. The two heavy quarks are in a dance that's just like the interaction of a star system with two suns and the third lighter quark circles the dancing pair, Wilkinson said. "People have looked for it for a long time," Wilkinson said. He said this opens up a whole new "family" of baryons for physicists to find and study. "It gives us a very unique and interesting laboratory to give us an interesting new angle on the behavior of the strong interaction (between particles), which is one of the key forces in nature," Wilkinson said. Chris Quigg, a theoretical physicist at the Fermilab near Chicago, who wasn't part of the discovery team, praised the discovery and said "it gives us a lot to think about." The team has submitted a paper to the journal Physical Review Letters. 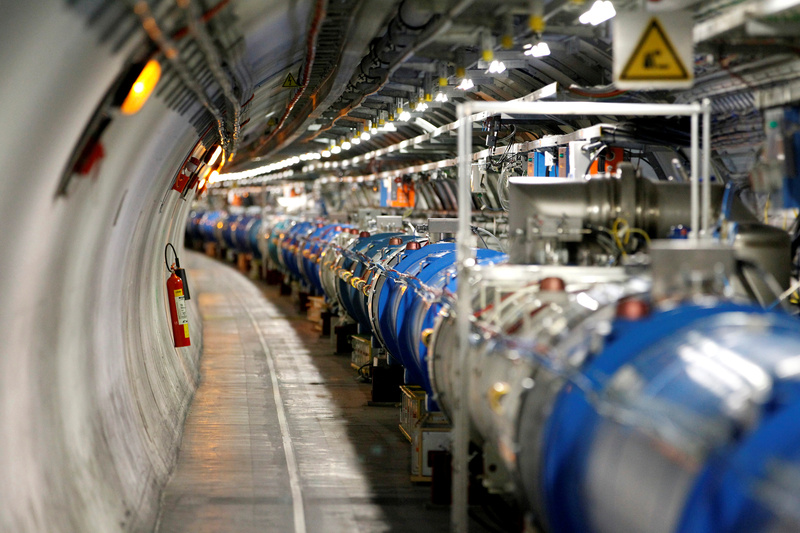 The Large Hadron Collider, located in a 16.8-mile tunnel beneath the Swiss-French border, was instrumental in the discovery of the Higgs boson. It was built by the European Organization for Nuclear Research, known by its French acronym CERN.